I love designing jewellery from simple earrings to complicated creations, I love creating them all. To me, I think the most important elements when designing is colour, shape and texture. I also feel if you hold a few different beads in your hand and are happy with the look of them in the palm of your hand, they can be made up into something nice...now this will work well if they are all different shapes but if they are all the same shapes but different colors, that is when you are going to have to add another element to make the design sing. By adding another element it can be as simple as a small spacer bead to emphasize the colours or a larger bead that spaces the beads to better show them. 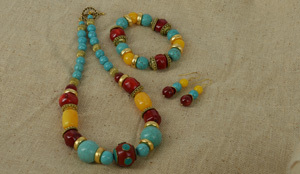 When I designed this set I had a very clear idea on how I wanted it to look but could not get the beads to sit the way I liked, I wanted the strong golden resin beads to be highlighted by a gold cap. My dilemma was the cap was not quite large enough or the right shape to fit either side of the barrel shape ...my solution was to turn the cap around so that it sat in a way I was happy with, without compromising the look I was going for. This set had so many redesigns I thought at one time it was just not going to happen. When I have this much trouble with a design, and usually this only happens with a symmetrical design, I start threading from the center as I get less frustrated if I don't waste slot of time retreading the same beads over and over. Asymmetric designing I find usually comes together quicker like this coral, pearl, onyx and banded agate set, which just went together with out any re-threads. Another helpful place I find inspiration is from images on the web. Try typing different search wording and download what ever takes your fancy, think of these images as an inspiration don't just copy (which is most of the time impossible anyway) they may inspire colour combinations or use of a particular bead, just download what ever grabs you. if you do this on your phone you will always have the inspiration with you. Once you start making jewellery I don't think it is at all possible to look at another commercially mass produced jewellery item without analysing how it was made, can I make it better, AND thinking "They are charging that!!!". To sum it up get your inspiration from where ever you can, seeing something in a shop, on another person, the TV (I have been known to stop a show and draw a picture of something that caught my eye) and don't forget very few designs are truly unique, jewellery designs have been being copied since the Egyptians.